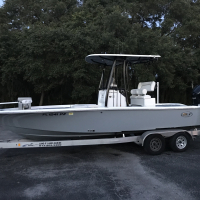 I have a gift certificate valued at $1595.00 (Specifically listed for the full value of the Power-Pole Pro 2 8' Shallow Water Anchor), I spoke with JL Marine and it can be redeemed for that item or used towards the purchase of any shallow water anchor and the difference paid. I am asking $1000 OBO. Please contact me via text or message on this site. This can be redeemed at any Power-Pole dealer by showing the front and back of the certificate for authentication.